The game dates back to the 1950s when a few manufacturers decided to take the popular bar game to the outdoors. The game was a little ahead of its time as there weren't all of the popular yard games around like we have today. Today you can't go to a tailgate anywhere without seeing bags, washers, ladder ball, or other games that test your accuracy and challenge your opponent. The first game sets were designed with 4 darts and 2 targets. The 4 darts were made with a heavy metal pointed tip that would allow them to stick into the ground without bouncing around. 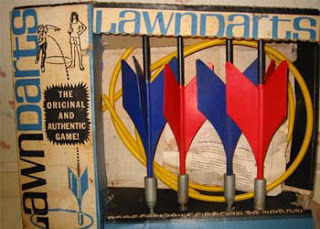 Because the manufacturers were more worried about the game actually working than the consumer safety, lawn darts now have a notorious history for being one of the most dangerous outdoor yard and tailgate games ever. Due to numerous accidents, the game was banned in the United States. The ban was then challenged by the manufacturers in court in the late 1970s, and the Consumer Product Safety Commission (CPSC) reinstated the game to the market as long as manufacturers did not market it as a toy. The game rose to popularity in the early to mid 1980s and it became one of the most popular yard games around. In April 1987, a 7 year old girl was killed by a lawn dart in her own backyard by a neighbor. The 7 year old's father lobbied for the next year to have them banned again from sales in the US. His case was that 6,100 people were injured from the game over the past 8 years and on the week of the ruling another 11 year old girl was hit by a lawn dart and sent into a coma. Effective on December 19, 1988, CPSC banned the sale of all lawn darts in the United States and asked consumers to discard or destroy their games immediately. Today there are some redesigned plastic and soft tip lawn darts available on the market. The CPSC takes many more precautions about the design of the game to ensure it is safe for children and adults alike. Just like most things that are outlawed, companies have found a loop hole in order to ship these into the US and Canada. They allow you to purchase the parts individually and assemble the darts yourself. They say that history will repeat itself if we don't learn from our past. We hope that anyone choosing to play the original game today is stands far back from the target areas and is serious about everyone's safety around them.